You know that petrol is used as a fuel in light automobiles such as motor cycles/ scooters and cars. Heavy motor vehicles like trucks and tractors run on diesel. Petrol and diesel are obtained from a natural resource called petroleum. Petroleum was formed from organisms living in the sea. As these organisms died, their bodies settled at the bottom of the sea and got covered with layers of sand and clay. Over millions of years, absence of air, high temperature and high pressure transformed the dead organisms into petroleum and natural gas. The world’s first oil well was drilled in Pennsylvania, USA, in 1859. Eight years later, in 1867, oil was stuck at Makum in Assam. In India, oil found in Assam, Gujarat, Mumbai High and in the river basins of Godavari and Krishna. The below shows the deposits of petroleum and natural gas. You see that the layer containing petroleum oil and gas is above that of water.Oil and gas are lighter than water and do not mix with it. Petroleum is a dark oily liquid. It has an unpleasant odour. It is a mixture of various constituents such as petroleum gas, petrol, diesel, lubricating oil, paraffin wax, etc. The process of separating the various constituents/ fractions of petroleum is known as refining. 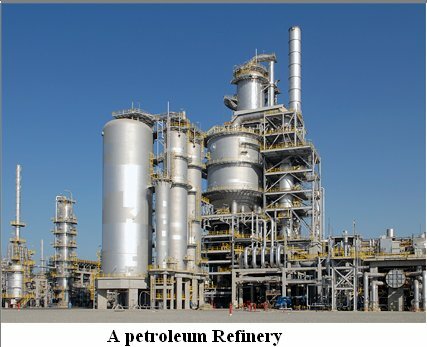 It is carried out in a petroleum refinery.At the refinery, the crude oil mixture is 'fractionated' into different components by fractional distillation. Many useful substances are obtained from petroleum and natural gas. These are termed as ‘Petrochemicals’. These are used in the manufacture of detergents, fibres (polyester, nylon, acrylic etc. ), polythene and other man-made plastics. Hydrogen gas obtained from natural gas, is used in the production of fertilisers (urea). Due to its great commercial importance, petroleum is also called ‘black gold’. Light gases are the topmost fraction, followed by petrol and kerosene. Diesel is the heaviest. The other heavier fractions are not useful and are usually used to make asphalt to surface roads.Various constituents of petroleum and their uses are given in Table . 6 Paraffin wax Ointments, candles, vaseline etc. You have studied in the beginning of the chapter that some natural resources are exhaustible like fossil fuels, forests, minerals etc. You know that coal and petroleum are fossil fuels. It required the dead organisms millions of years to get converted into these fuels. On the other hand, the known reserves of these will last atmost a few hundred years. Moreover, burning of these fuels is a major cause of air pollution. Their use is also linked to global warming. It is therefore necessary that we use these fuels only when absolutely necessary. This will result in better environment, smaller risk of global warming and their availability for a longer period of time. Ensure correct tyre pressure, and  Ensure regular maintenance of the vehicle. Petroleum and natural gas are formed from compressed organic matter. The first oil well in the world was drilled in Pennsylvania, USA. Petroleum gas, petrol, diesel, kerosene, paraffin wax, lubricating oil are obtained by refining petroleum. Coal and petroleum resources are limited. We should use them judiciously.